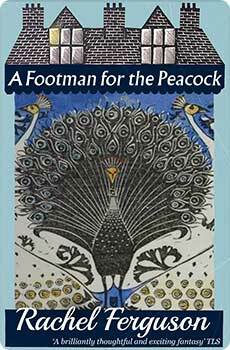 Controversial when first published in the early days of World War II, due to its treatment of a loathsome upper-crust family dodging wartime responsibility, A Footman for the Peacock can now be enjoyed as a scathing satire of class abuses, a comic masterpiece falling somewhere between Barbara Pym and Monty Python. Sir Edmund and Lady Evelyn Roundelay live surrounded by a menagerie of relations and retainers. The Roundelays’ history of callous cruelty is literally etched on a window of the servants’ quarters with the words “Heryn I dye, Thomas Picocke. 1792”. Sir Edmund reflects cheerfully on the running footmen who have ‘died off like flies’ in the family’s service. But now—amidst digressions on everything from family history and servant woes to the villagers’ linguistic peculiarities and a song immortalizing the footman’s plight—war threatens the Roundelays’ smug superiority. What’s more, it appears that the estate’s peacock is a reincarnation of Thomas Picocke, and may be aiding the Nazi cause … By turns giddy and incisive, hilarious and heartbreaking, A Footman for the Peacock is Rachel Ferguson at her very best. This new edition features an introduction by Elizabeth Crawford.